Since its release, Brian Nelson’s Nurgle Chaos lord has been a key component to countless imaginative conversions. In particular, it has been championed by the Inq28 crowd to make everything from daemonhosts to weapon servators (JRN’s daemonhost and Migula’s weapon smith, are excellent examples). It is not difficult to understand why the model has received so much attention, it is both hideous and majestic in its corpulent, rotting splendor, dripping with vile ichors and donned in corroding metal. It was also one of the first plastic character models Games Workshop released that, while multi-part, was intended to be assembled in one way. By restricting the the posing, they were able to produce models with astounding depth, with parts layering on top of another (Malifaux plastic miniatures excel in this, as well). As such, I was very excited when the Putrid Blightkings, a whole unit of foetid servants of Nurgle, much like Nelson’s model, were unveiled. Brian Nelson's much lauded Chaos Lord next to one of the new Blightkings. 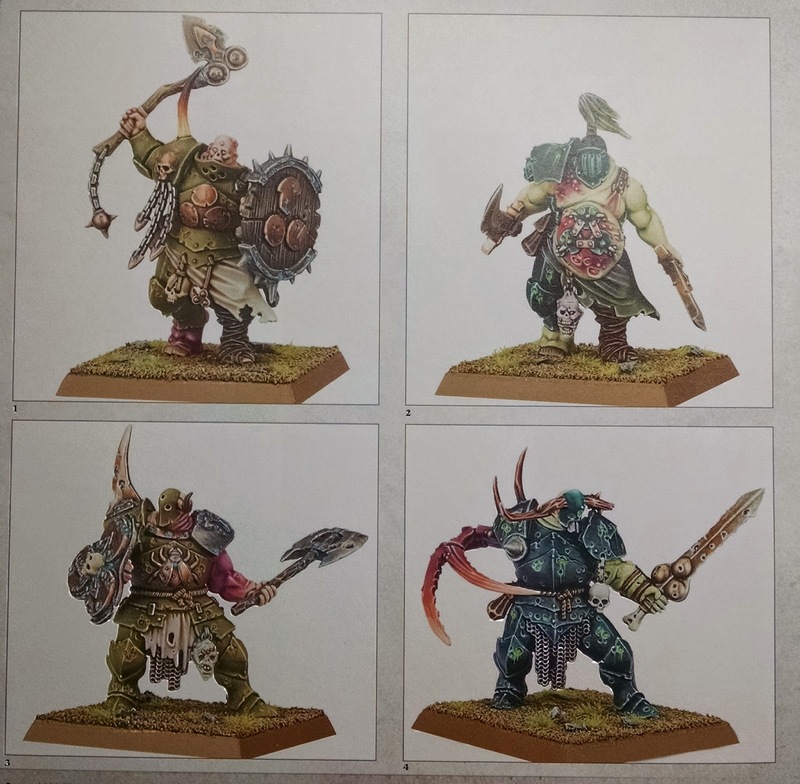 The Blightkings build upon an image of the patrons of Nurgle that has been around for many years, but has only recently been reflected in its models. Bloated, dripping carrion lords, in broad plain armour. Pitted and corroded slabs of sharp rusted steel coming together to form malevolent weapons, glistening with untold pestilence. Plain helms with grim vision slits or, worse, none at all, revealing sickening grimaces. Long lolling tongues and singular ivory horns. Exposed bellies, awash in boils, torn with gleaming grey entrails. The air abuzz with black blowflies. You might think: “of course that is Nurgle, it has been that forever,” but I would argue that if you think back, very few of their models really fit this theme. Instead, they were caricatured, goofy monstrosities, or amorphous blobs of modeling putty (thinking of the last metal rendition of the plaguebearers). 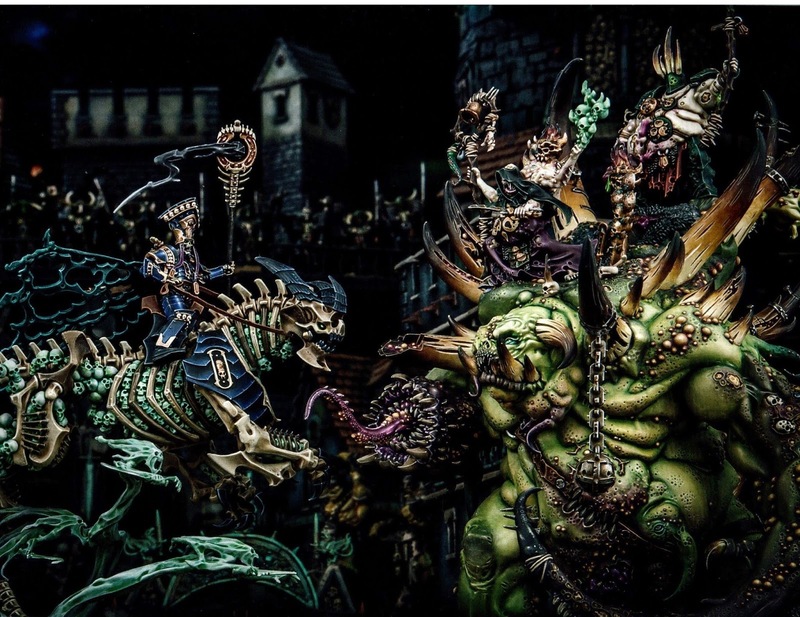 This began to change for the better when Jes Goodwin sculpted the seminal Nurgle Chaos lord riding a rotting horse (there was one on foot was cool too!). Conjuring up images of an entropic reaper, with a worn scythe and tattered robes, covered in filthy chainmail, with a hooded face crested by thorny antlers. When I first saw him, I knew I needed to form an entire Nurgle army, but I held back because none of the other models held a candle to it. I am pleased to say that the new Blightkings have all of the hallmarks of Nurgle that I just described. In a clear nod to Jes’s creation, one of the heads in the new kit has a pair of mouldering antlers sprouting from a ratty hood covering a chainmail mask. They even included a menacing scythe to go with him! 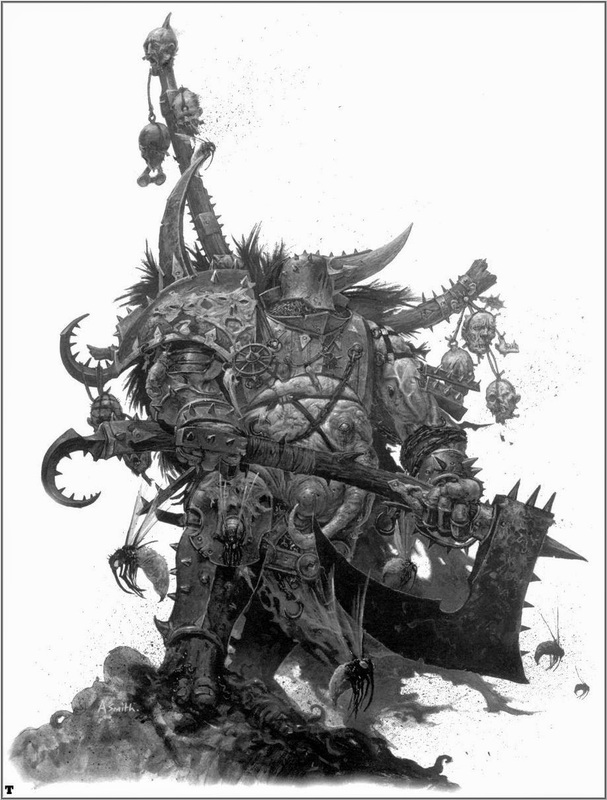 One of many incredibly evocative Nurgle illustrations from over the years (this one by Adrian Smith) that, until only recently, had very few models emulating its style. Jes Goodwin's classic Nurgle Lord was a triumph when released (and still is), and has clearly influenced the new Blightkings. 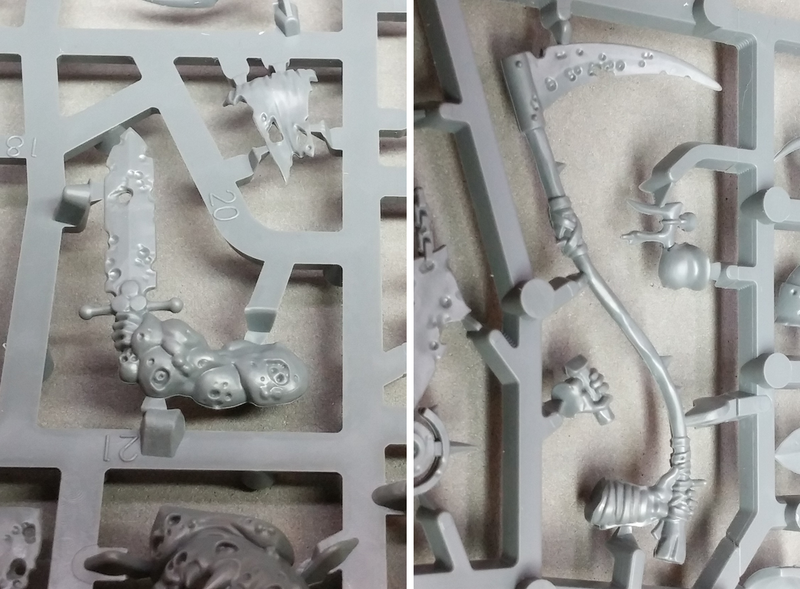 Upon opening the box you are greeted with three sprues filled with all sorts of delightful, yet sickening bits. It has a selection of some of the best Nurgle themed weapons available, each a terrifying fragment of rusted iron, notched from heavy use, held atop wiry dark hafts of thorned wood. Most of these weapons are also reasonably sized (at least for Warhammer), realizing that bigger does not always make better. There are countless heads. drawing inspiration from the simplicity of the excellent plastic warriors of Chaos, one even mimics the iconic Adrian Smith illustration with a titanic horn protruding from the front. 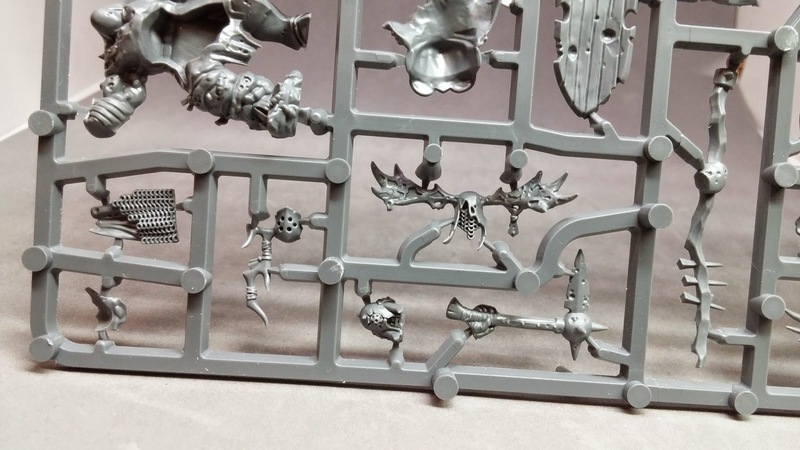 They also include a variety of heads that more closely resemble Grandfather Nurgle and his lesser plaguebearers, allowing you to build warriors further along on their ascension to daemonkind. 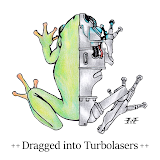 Their arms are suitably varied as well, from clad in interlocking platemail, to festering with maggots, to distressing insectile claws, and even grasping tentacles. Their bodies follow suit, with segmented breastplates, to exposed bellies with gaping maws and exposed intestines. Look at all these crazy antlered helmets! A selection of the dilapidated weapons that come in the box. Quite a wicked looking hooked dagger, as well as a repulsive flabby body (with a bell tolling inside!). 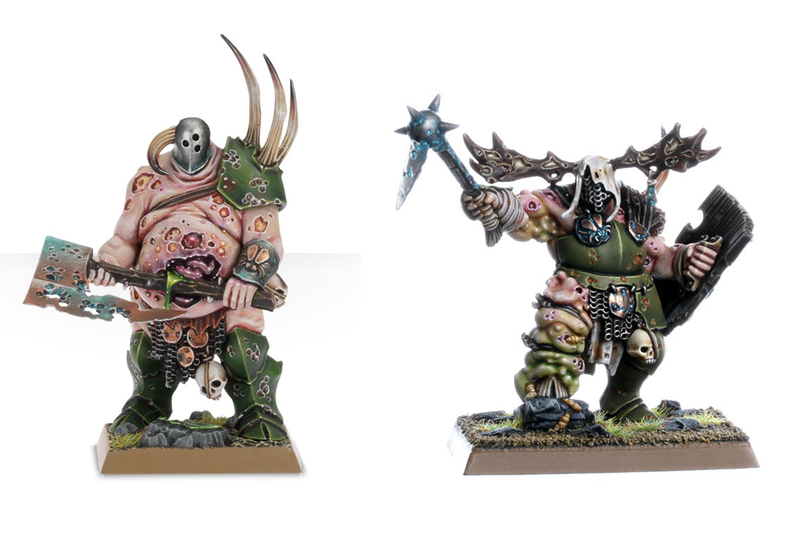 Amazingly, even though each Blightking looks like a character in its own right, each was carefully designed to be assembled in at least two surprisingly divergent ways. The assembly is anchored by the legs, which remain invariant (all 5 are unique however), but different breastplates and bodies are layered on top, along with arms that are specifically designed for each. This allows for creating a wide variety of distinct models, without limiting the sculptors’ creative vision. Multi-part kits usually allow for a lot of freedom in how the models are assembled, and offer the opportunity to create a wide array of poses. However, in most cases, only a select few poses actually look natural. 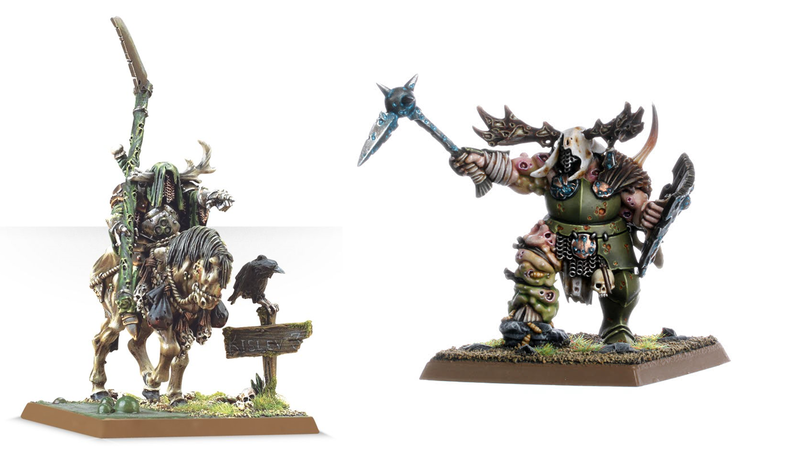 Games Workshop’s new approach with the Blightkings provides some freedom to the consumer, while also letting the sculptors truly explore and convey their own creative vision. And while some may argue that it makes conversions more difficult because you cannot simply swap an arm or body, I think it just encourages people to step out of their comfort zone and attempt more elaborate conversions, ones that are more than simply kitbashes. Although each pair of models was made using the same set of legs, they ultimately created very different models. Some of the Blightkings have become so bloated and repulsive that their once proud armor has long since been cast aside. As I mentioned above, I believe that the complexity of the kit will make conversions more challenging, but they are far from impossible. 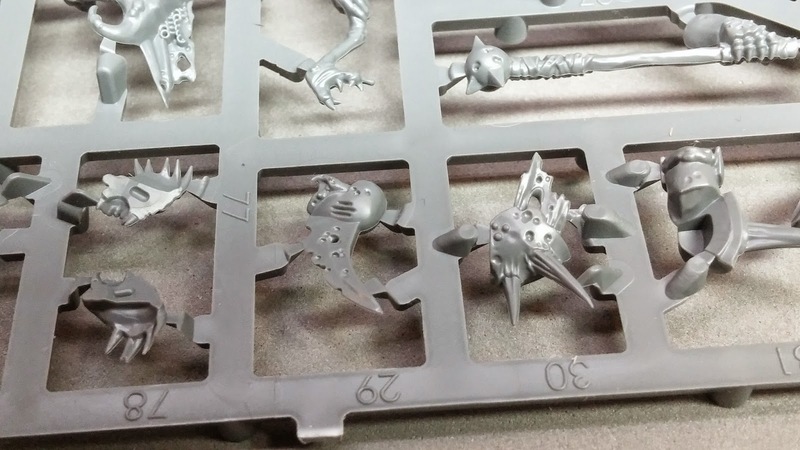 In fact, I predict that the kit will be the starting point for almost all Nurgle conversions from here on out, certainly for Nurgle-themed Warriors of Chaos armies. Their size also lends them well for Deathguard conversions. As all followers of Mortarion know, there has been a dearth of models for his iconic Plague Marines. 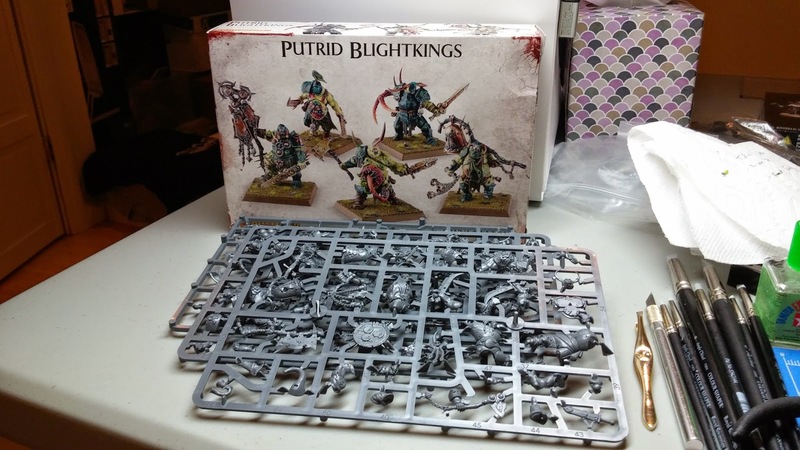 In particular, with careful planning and cutting, I think the Blightkings will be fantastic for making a unit of Deathguard Terminators, something that I have been wanting to create for years. After all, I have countless plastic terminators, as well as a few Forge World ones kicking around here… Krautscientist from the Eternal Hunt has already started scheming and experimenting with the kit, as well as Jeff Vader from Officio Convertorum, so it is only a matter of time before we see some excellent conversions! Upon seeing this, I defy you to say it is anything but epic! Needless to say, I am extremely impressed with the new Blightking models. The End Times, which started with the release of the re-envisioned Nagash, is shaping up to be truly remarkable, and certainly the best thing that has happened to Warhammer (and arguably 40k) in years. The excellent releases are showing no evidence of stopping either, with the imposing Maggoth Lords coming out this week, and the even more cyclopean Glottkin that promises to be revealed this weekend. It is certainly an exciting time to be a follower of Chaos, Nurgle especially. But ultimately with models so characterful, it is exciting regardless of your allegiance! Great overview eric! If you get a chance (once you have these assembled), please post some scale shots next to 40k models if you have them! I am glad you enjoyed it! I will certainly put up some size comparisons when I get some of them together. If you have not seen it yet, I would suggest you go over to the Eternal Hunt, where Krautscientist took a few scale shots. It really does look like there is a worthy selection of bits, and massive scope for conversions. I like the idea of people being pushed to go that bit further in what they are trying to achieve. Quite excited by this kit. Yeah I am really excited by all the possibilities opened up with the kit. The complexity of the models lends themselves for conversions only to a point, encouraging some drastic cutting a green stuff work. All techniques you can really only learn by first hand experience and taking some risks. I'm stoked to start seeing these reviews pop up for this kit, as well as others in the kitbashing community start to play with them. Aside from the Scions earlier this year that I have thus far managed to restrain from purchasing, nothing has really struck my fancy in the releases so far. That was until these boys popped up. Wow - what a fantastic looking kit. I have a WoC force lurking in a box that I had themed for Nurgle - these guys would fit right in - though if I did slip and buy a set I think it would be to use as themed cult leaders in a Lost and the Damned style combined arms list (cultists supported by the odd Plague Marine war band leader like you read about in the fluff rather than full on squads of Marines). Very much looking forward to how you utilise the set. When I first saw these guys I was shocked at how well they came out, and how they created a new unit that I actually wanted to have (at this point I feel I would rather they make some units that already have rules for then entirely new stuff; greater daemons perhaps?). Your Lost and the Damned idea sounds wonderful! I loved the Eye of Terror Codex. Making a few characters to lead the loathsome masses of traitor guard would be excellent. A much needed overview before I decided to get my hands on a box of these! Now I'm convinced that the casting quality for GW models has improved tremendously, seeing all those sculpted details. That is amazing. Looking forward to seeing your rendition of these beasts! I am glad the post was helpful! 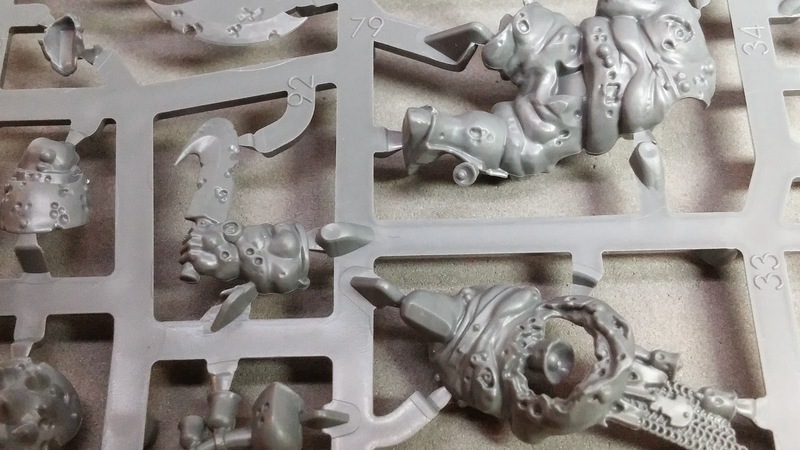 It is certainly true that GW's casting quality has increased dramatically.over the years. Everything is extremely crisp and detailed. Often times I think the plastics look better then the 'Eavy Metal paint jobs, because they sometimes layer paint on pretty thickly, obscuring the fine cast. It's so nice to see this sort of excellent overview and a refreshing nod to the backstory. I am happy you enjoyed it! The models are just so evocative that I could not help but write a review of them. Their release was so unexpected, and ultimately set of models I had been hoping to see for a long time.